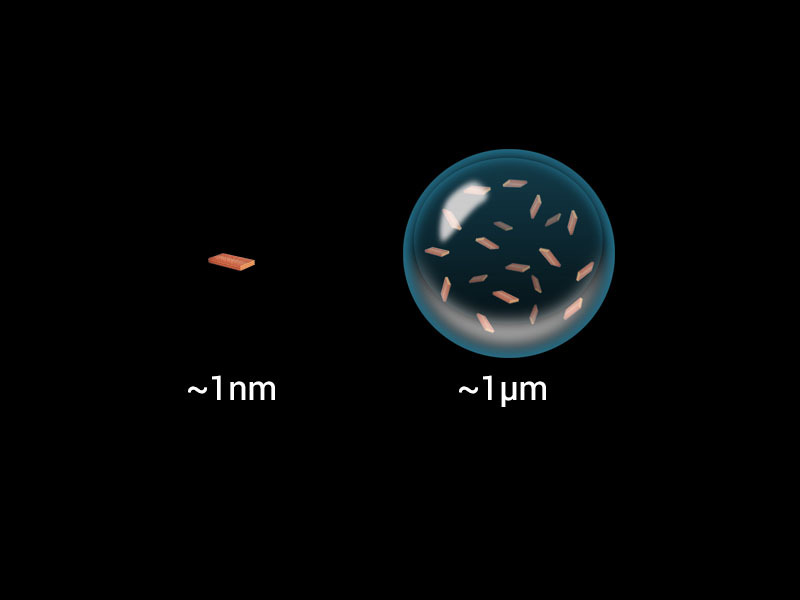 Nexdot has developed an exclusive process to encapsulate nanoparticles in Quantum Pearls. We have an excellent control on the size, composition, and density of these unique pearls. This technology allows us to retain the luminescent properties of our Quantum Plates while providing a simpler solution that can be integrated into existing industrial processes. In addition, encapsulation is able to provide a barrier against water and oxygen, molecules that can damage Quantum Dots and Quantum Plates. Finally, this specialized technique makes all Quantum Dots, even the best performing ones containing cadmium, RoHS compliant. As most existing production lines with potential Quantum Dot applications operate at the micrometer scale, making the change to nanometric precision would be very expensive. The encapsulation technology developed at Nexdot makes it possible to transfer our nanometric Quantum Plates into the micrometric scale. These Quantum Pearls containing the Quantum Plates, which retain their properties, are large enough to be easily adapted into existing processes. For instance, these pearls can be manufactured to the same size as phosphors that are currently used in screens. Water and oxygen molecules must not come into contact with Quantum Plates. In currently manufactured solutions incorporating Quantum Dots, they are protected by a film whose implementation is complex, and expensive. Our encapsulation technology completely isolates the Quantum Plates from air and moisture. They can therefore be used directly without additional protection. By decreasing the density of heavy metals, Nexdot encapsulation can make all Quantum Dots compatible with RoHS. Our encapsulation method can be applied to all nanoparticles, whether they come from our production unit, or manufactured by a third party supplier.